Ever wake up craving a smoothie, but don’t know which flavor to make? 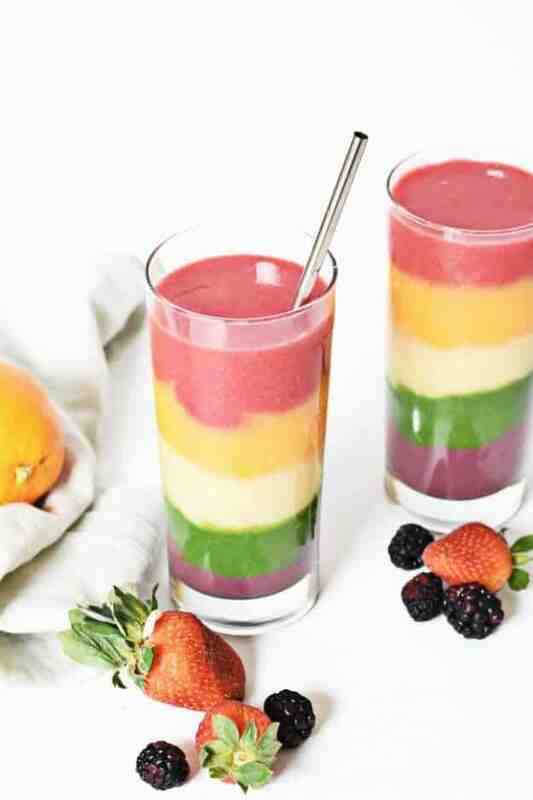 Blend up a rainbow smoothie instead! 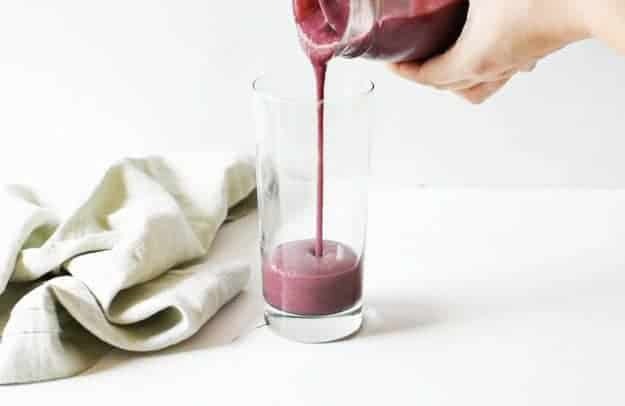 This smoothie is packed with fruits and veggies, contains zero dyes, and adds a fun and colorful way to load up on your vitamins and minerals for the day. And obviously, it’s kid-approved too! High powered blender. I use this blender. Frozen strawberries, raspberries, mangoes, oranges, pineapple, bananas, blueberries, açaí, blackberries, and spinach. 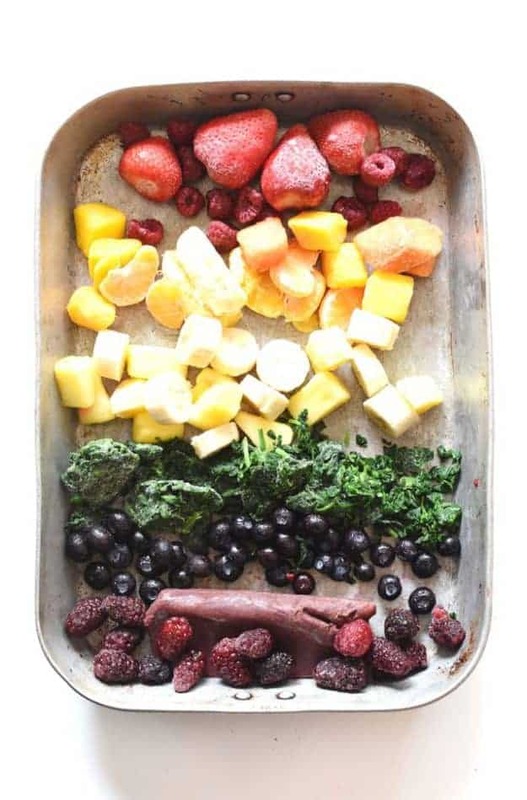 Step 1: Separate the frozen fruits and veggies into their colors on a baking sheet. Step 2: Start with the red smoothie layer. Blend together strawberries, raspberries and 1/4 cup coconut water. Pour into a separate bowl or cup. Step 3: To make the orange layer, blend together mango, oranges, 1/2 banana, and 1/4 cup coconut water. Transfer to a separate bowl or cup. Step 4: For the yellow layer, blend together pineapple, 1 frozen banana, and 1/4 cup coconut water. Transfer to a separate bowl or cup. Step 5: To make the green layer, blend together spinach, 1 frozen banana, and 1/4 cup coconut water. Transfer to a separate bowl or cup. Step 6: Lastly, make the purple layer. Blend together blackberries, blueberries, acai, and 1/4 cup coconut water. Transfer to a separate bowl or cup. Step 7: Arrange your bowls and cups of smoothies by color. Use a spoon to layer in each color into a large glass, starting with purple at the bottom. Add about 1 tablespoon at a time, and a total of 3-4 tablespoons in each layer. Be careful not to add too much at once, or the colors will run together. Layer green next, then yellow and orange. Finish topping off the rainbow smoothie with the red layer. You may need to add more coconut water to each layer, depending on the power of your blender. (For best results, use a high-powdered blender.) Start with 1/4 cup coconut water to get it to the consistency of your liking. Make sure it is still thick enough to layer. If smoothie becomes too thin, add in frozen banana to thicken. Individual color layers can be placed in bowls in the freezer for 5-10 minutes to thicken. Add each layer in tablespoon increments. Be careful not to add too much at once, or the colors will run together. I am not a coffee drinker, so smoothies are my morning beverage of choice. They give me the same amount of energy, if not more, and my kids love them. I sneak in every vegetable and vitamin possible (this one has loads of Vitamin C and antioxidants! ), so I know they are getting their daily nutrients. You’re welcome, picky eater moms! 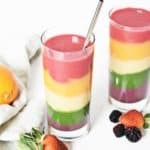 If you try this rainbow smoothie recipe, please let me know how you like it in the comments below. I absolutely love hearing from you! 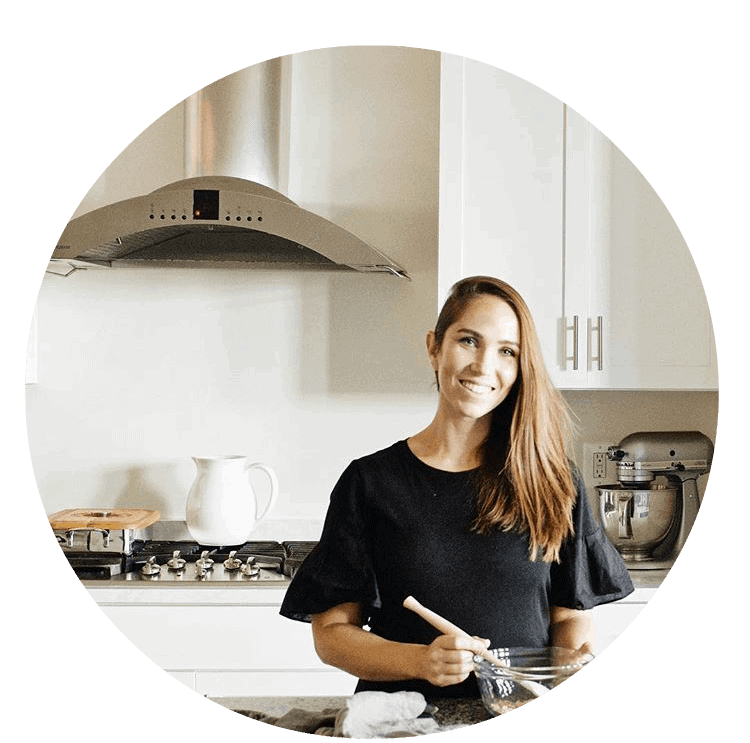 You can also FOLLOW ME on Instagram, Pinterest and Facebook, for more nourishing recipes like this, and behind the scenes cooking and holistic wellness tips! Separate frozen fruits in their specified quantities on a baking sheet or cutting board. Start with the red smoothie layer. Blend together strawberries, raspberries and 1/4 cup coconut water. Pour into a separate bowl or cup. To make the orange layer, blend together mango, oranges, 1/2 banana, and 1/4 cup coconut water. Transfer to a separate bowl or cup. For the yellow layer, blend together pineapple, 1 frozen banana, and 1/4 cup coconut water. Transfer to a separate bowl or cup. To make the green layer, blend together spinach, 1 frozen banana, and 1/4 cup coconut water. Transfer to a separate bowl or cup. Lastly, make the purple layer. 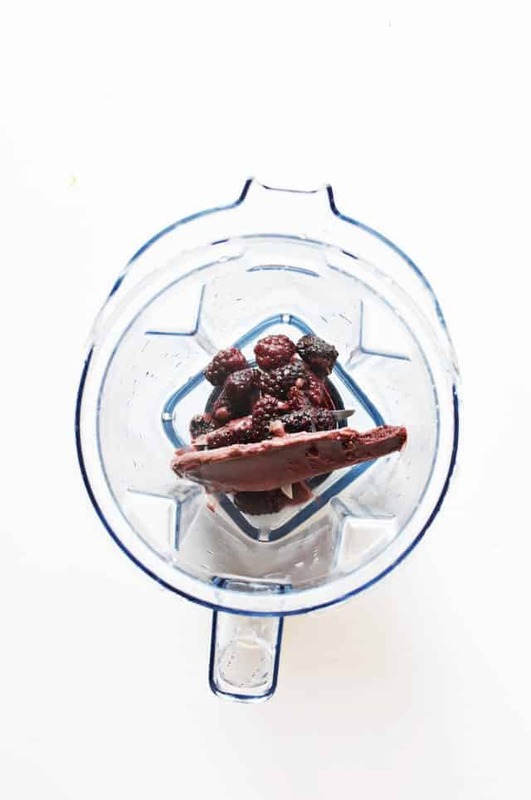 Blend together blackberries, blueberries, acai, and 1/4 cup coconut water. Transfer to a separate bowl or cup. Arrange your bowls and cups of smoothies by color. Use a spoon to layer in each color into a large glass, starting with purple at the bottom. Add about 1 tablespoon at a time, and a total of 3-4 tablespoons in each layer. Be careful not to add too much at once, or the colors will run together. Layer green next, then yellow and orange. Finish topping off the rainbow smoothie with the red layer. This is awesome! I love smoothie! Yum!